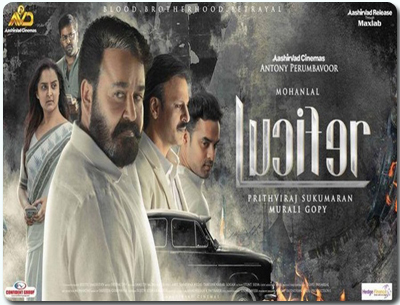 Lucifer is a 2019 Indian Malayalam language action film directed by Prithviraj Sukumaran and written by Murali Gopy and it got released on 28th march 2019. Mohanlal plays the lead role for the film. The film is produced by Aashirvad Cinemas. Lucifer is one of those rare commercial films. Stephen Nedumpally (Mohanlal) and Bobby (Vivek Oberoi) are facing each other for the first time in the movie. The former is displeased with the latter’s plan to raise funds for the party by smuggling killer drugs. Stephen calmly announces to the audience that those who know me understand this very well about me. I have always said that narcotics is a dirty business. Lucifer, first and foremost, is an unrepentant, glorified tribute by a fanboy to his idol. Lucifer is one of those rare commercial films that need not to take the common route of establishing heroism. The film begins with the death of P.K Ramada, the supreme of a ruling political party, IUF. The tussle ensures after that as the loss creates a leadership crisis amongst the members of the party. Ramada’s daughter Priyadarshini Ramada, her husband and the party's financial source, Bobby want to be the indirect whip of the party. The party top brass and Ramada’s family come up with a suggestion to anoint the deceased CM’s younger son Jathin Ramdas (Tovino Thomas) as the successor. This was acceptable for the major players as it would sideline the powerful Stephen Nedumbally, Ramdas’ foster son. Bobby is planning to cash in on the opportunity as he strike deals with some underworld gangs to trade drugs. He is looking for the right climate to bring in hefty funds and initiate drug dealings. Stephen has run into orphanage and forms a huge popularity in his party. Bobby and Stephen have a fight with each other. Stephen says, a war is never between good and evil, it is actually between bigger evil and lesser evil. The movie is produced by Aashirvad Cinemas. The music of the film is composed by Deepak Dev.